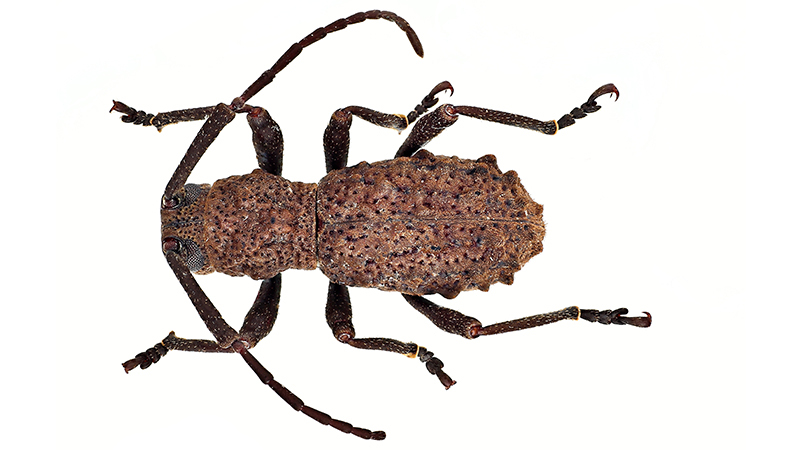 A remarkably high diversity of the wingless long-horned beetles in the mountains of northern Borneo is reported by three Czech researchers from the Palacký University, Olomouc, Czech Republic. Apart from the genera and species new to science, the entomologists report the first case of reproduction by live birth in this rarely collected group of beetles. The study was published in the open access journal ZooKeys. Generally, insects are oviparous, which means that their females lay eggs and the embryonic development occurs outside the female’s body. On the other hand, ovoviviparous species retain their eggs in their genital tracts until the larvae are ready to hatch. Such mode of reproduction is a relatively rare phenomenon in insects and even rarer within beetles, where it has been reported for a few unrelated families only. The long-horned beetles are a family, called Cerambycidae, comprising about 35,000 known species and forming one of the largest beetle groups. The scientists focused on the group which nobody had studied in detail for more than 60 years. They found surprisingly high morphological diversity in this lineage, which resulted in the descriptions of three genera and four species new to science. However, according to the authors, the modes of reproduction remain unknown for many beetle lineages besides Cerambycidae, so the ovoviviparity might be, in fact, much more common. Further detailed studies are needed for better understanding of the reproductive strategy in this group.